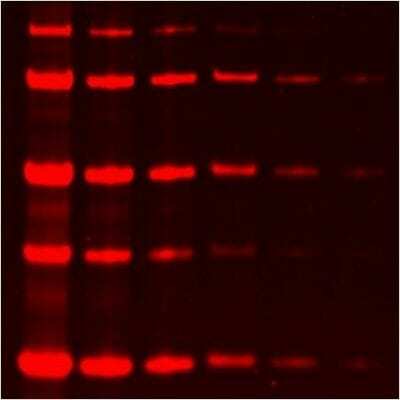 Is protein staining on SDS-PAGE gels with the One-Step protein stains compatible with western blotting? 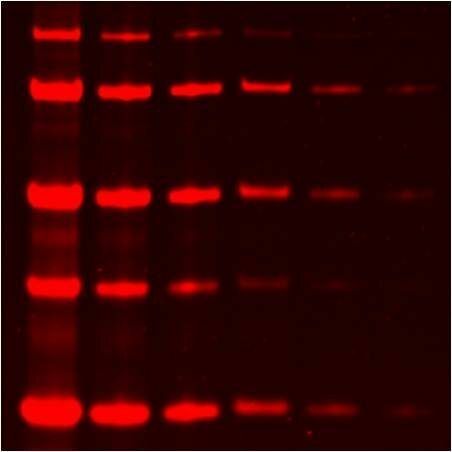 We do not recommend staining proteins on the polyacrylamide gel with the One-Step protein gel stains before western blotting as it can significantly reduce protein transfer to the membrane. If protein detection on the gel prior to transfer is desired, the Total Protein Prestains would be more suitable. The Mix-n-Stain™ Total Protein Prestain Kits allow simple, sensitive and highly linear protein quantitation on SDS-PAGE gels and western blot membranes. The kits allow you to label purified proteins or cell lysates with our near-infrared CF® dyes before running the samples on SDS-PAGE. After electrophoresis, the bands can be visualized on the gel using a fluorescent gel scanner, allowing detection of as little as 1 ng protein per band. Labeled proteins also can be transferred to membranes for western blotting. The staining demonstrates excellent linearity for quantitation of total protein over a wide dynamic range, outperforming traditional western blot normalization based on housekeeping protein detection. 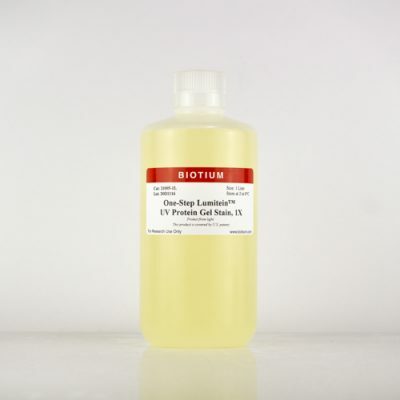 One-Step Lumitein™ UV Protein Gel Stain is a ready-to-use luminescent protein gel stain. Gels stained with One-Step Lumitein™ UV Protein Gel Stain can be visualized with a variety of different UV-based fluorescence imaging systems. One-Step Lumitein™ UV gel staining requires only a single 5-30 minute staining step without fixation. Destaining is optional. Moreover, One-Step Lumitein™ UV Protein Gel Stain offers safer handling and ease of disposal, because it is an aqueous-based solution that does not contain hazardous methanol or acetic acid. One-Step stains are certified under CCR Title 22 as non-toxic to the environment for drain disposal after a simple pH neutralization step. Furthermore, One-Step Lumitein™ UV costs significantly less than other fluorescent protein gel stains. One-Step Lumitein™ UV Protein Gel Stain is available in 1 liter bottle or 4 liter Cubitainer® sizes. One-Step Lumitein™ UV can detect as little as approximately 1-10 ng of protein per band depending on the staining method used, although staining intensity varies between proteins. The results obtained with One-Step Lumitein™ UV are comparable to those with Oriole™ Fluorescent Gel Stain; however, One-Step Lumitein™ UV has a more convenient protocol, does not contain hazardous solvents, and does not cause gel shrinkage. Staining is fully compatible with mass spectrometry and Edman-based sequencing. Biotium also offers One-Step Lumitein™ Protein Gel Stain, which can be imaged using a UV transilluminator, visible light gel imager, or laser-based gel scanner (such as a Typhoon® scanner). One-Step Lumitein™ UV gives a better signal on a UV box than One Step Lumitein™, but is not compatible with a blue light illuminator or laser-based scanner. Biotium also offers One-Step Blue™ Protein Gel Stain, a rapid, easy-to-use, non-toxic alternative to Coomassie staining for visible blue protein staining and optional near-infrared fluorescence-based gel imaging. Oriole is a trademark of Bio-Rad. Cubitainer is a registered trademark of Hedwin Corporation.